Hepatitis B virus (HBV) infection is a serious public health problem worldwide, especially in Asia and Africa. The disease can develop into chronic hepatitis, cirrhosis, hepatocellular cancer, and finally death. Therefore, the incidence of the disease varies from the person-to-person,, but the mechanism of disease is not clearly found. Most likely, there is a close connection between T-cells and modes of infections. Interleukin 10 (IL-10), IL-28,, macrophage migration factor, interferon lambda 4 are proteins that control the cascades of the human immune system in chronic infections such as HBV/hepatitis C virus (HCV) through the reduction of the viral replication. Furthermore, the genetic history of individuals has a significant impact on the incidence of disease. On the other hand, the concentration of regulatory proteins in the blood can also affect the course of the disease. Genetic changes such as single nucleotide polymorphisms (SNPs) in the sequences that affect the function of the gene can change the production of protein. The host immune responses are supported by the connective tissue (CT). The structure and normal function of CT is affected by the molecular composition of its extracellular matrix (ECM) which contains glycoproteins and structural proteins. Abnormal synthesis or degradation of ECM contents such as laminin, collagen, and elastin can change the pathophysiology of infectious and some diseases including prolapse. The results have revealed that the amount of collagen decreases in the CT of patients with female pelvic floor disorders. Furthermore, an increase or no changes have reported in collagen expression in patients with stress urinary incontinence. Moreover, ECM deficiency leads to fibrosis which is the result of failing in normal tissue contents and function. After a chronic infection, a wound-healing response induces in tissues. This phenomena causes a new ECM for maintaining the tissue homeostasis. If the infection is long-lasting, or the genetic mutations are existing in ECM pathways, may result in the fibrosis and disease severity. The host immune responses against HBV infection involves signaling pathways and regulatory systems which can be disrupted. In this pilot study, we describe how the SNPs of L-leucine-7-amido-4-methyl coumarin 1 (LAMC1) contribute to susceptibility to chronic HBV infection. Laminin is a noncollagenous element of the basement membranes. It has been contributed to cell adhesion, differentiation, migration, signaling, and metastasis. Laminin has three nonidentical chains: Laminin alpha, beta and gamma. LAMC1 codes the laminin gamma1 chain, as a critical component of the ECM. Previous studies indicated that the rs10911193T allele in the gene promoter was significantly prevalent among patients with prolapse. The goals of this pilot study were to determine if polymorphisms in the LAMC1 gene (rs20558, rs20563, rs10911193, rs10911251, and rs1413390) were associated with the susceptibility to chronic HBV infection in a sample of Iranians. In this case–control, 100 chronic HBV patients showing positive hepatitis B virus surface antigen (HBsAg) and antibodies against anti-HBc and impaired liver function test (≥2 times the upper limit of normal) for at least 6 months were enrolled into the study (age: 29.03 ± 5.710, age range of 18–43). Serological tests (presence of HBsAg by enzyme-linked immunosorbent assay (ELISA) and HBV-DNA by reverse transcription polymerase chain reaction (PCR) and clinical findings were compatible with the chronic liver disease. 40 patients with negative HBsAg and anti-HCV and positive antibodies against anti-HBs and anti-HBc were also included as spontaneously recovered (SR) group (age: 29.72 ± 5.517, the age range of 18–42). The control group comprised 100 HBsAg, anti-HBs and anti-HBc negative, healthy volunteers with normal values for alanine transaminase, without any history of hepatitis B infection (age: 30.44 ± 4.539, the age range of 22–45). All participants were in the same geographical area. All participants were unrelated Iranians. There was no difference between groups regarding age, gender, and ethnicity [Supplementary Table 1 [Additional file 1]]. Participants with HCV, Hepatitis E virus, HAV, HIV, alcohol consumption, drug abuse, liver diseases were excluded from the study. Between July and December 2015, the study population was recruited, and they were enrolled in the outpatient clinic of the blood transfusion organization clinics in Zahedan, Iran. The study was approved by the Institutional Ethics Committee of the Zahedan University of Medical Sciences (IR. ZAUMS. REC.1395.159, grant number: 6809) and carried out in Infectious Diseases and Tropical Medicine Research Center, Zahedan, Iran. Written informed consent was obtained from each participant. Biochemical parameters and serum level of laminin were determined by the sensitive sandwich ELISA technique (EASTBIOPHARM, China) using 3 ml of blood. Genomic DNA was extracted from blood using the salting-out method. The LAMC 1 polymorphisms rs20563 and rs10911193 were detected by PCR–restriction fragment-length polymorphism (PCR-RFLP). The rs20558, rs10911251, and rs1413390 were analyzed by amplification-refractory mutation system (ARMS-PCR). The sequence of the primers, restriction enzymes, and the fragment length after digestion is shown in [Supplementary Table 2 [Additional file 2]]. PCR amplification was carried out in a total volume of 20 μL containing 1 μl of each primer, 100 ng of template DNA and 10 μl of 2X Prime Taq Premix (Genet Bio, Korea) and 7 μl ddH2O. The annealing temperature was 60°C for rs20563, 59°C for rs10911193 polymorphisms of the LAMC1. Digestion was done by the restriction enzymes (Fermentas, Vilnius, Lithuania) and products were checked by electrophoresis (2% agarose gel and ethidium bromide). ARMS-PCR reactions were performed using 2X Prime Taq Premix (Genet Bio, Korea). For each sample, we used two tubes, one for wild allele and another tube for the mutant allele. In each 0.20 ml reaction, 1 μl of each primer (allele-specific and inner control primers), 1 μl of genomic DNA (~100 ng/ml) and 10 μl of 2X Prime Taq Premix (Genet Bio, Korea) and 5 μl ddH2O were added. One tube contained forward primer (F) and reverse primer (R1) for wild allele and the other tube contained forward primer (F) and reverse primer (R2) for the mutant allele. All tubes had forward primer and reverse primer for inner control (F, R) which was part of the LAMC1 gene sequence. PCR reaction was performed according to the following protocol: initial denaturation: 95°C for 5 min, 35 cycles of denaturation: 95°C for 30 s, annealing: 57°C rs20558, 59°C for rs10911251, and 60°C for rs1413390 for 30 s, extension: 72°C for 30 s and final extension: 72°C for 5 min. The amplified products were resolved by electrophoresis in 2% agarose gel and stained with ethidium bromide. Descriptive statistics were conducted using SPSS 20.0 (IBM, Armonk, NY, United States of America) and assuming an alpha level of 0.05. Data were expressed as a mean ± standard deviation. The comparing the data were done by Chi-square analyses and Student's t-test. To test for association of single SNPs with disease, we constructed logistic regression models. Summary results of the clinical characteristics are shown in [Supplementary Table 1]. The population of the study was comprised chronic HBV-infected, SR and healthy controls. The gender, ages, and ethnicities were not significantly different between the three groups (P = 0.427, P = 0.125, and P = 0.292). Genotyping findings of rs20558, rs20563, rs10911193, rs10911251, and rs1413390 in the laminin gene are listed in [Table 1] and [Table 2]. The distribution of polymorphisms in control group was based on the Hardy–Weinberg equilibrium (P = 0.152 for rs20558, P = 0.101 for rs20563, P = 0.180 for rs10911193, P = 0.074 for rs10911251, and P = 0.0681 for rs1413390 P > 0.05). Distribution of the rs20558C allele had higher frequency in HBV patients compare to the rs20558T allele and increased risk of disease (P = 0.001, odds ratio [OR] = 2.062, 95% confidence interval [CI] = 1.360–3.125). Distribution of the rs20563G allele had higher frequency in HBV patients compared to the rs20563A allele and increased risk of disease (P = 0.001, OR = 2.062, 95% CI = 1.360–3.125). Distribution of the rs10911193T allele had higher frequency in HBV patients compare to the rs10911193C allele and increased risk of disease (P = 0.008, OR = 1.826, 95% CI = 1.171-2.849) [Table 1]. This study showed that the existence of rs20558C, allele significantly increased risk of chronic HBV infection compared to the rs20558T allele (P = 0.001, OR = 2.062, 95% CI = 1.360–3.125). In addition the results showed that the rs20563G allele significantly increased risk of chronic HBV infection compared to the rs20563A allele (P = 0.001, OR = 2.062, 95% CI = 1.360–3.125). On the other hand, the results revealed that rs10911193T allele significantly increased risk of chronic HBV infection compared to the rs10911193C allele (P = 0.008, OR = 1.826, 95% CI = 1.171–2.849) [Table 1]. 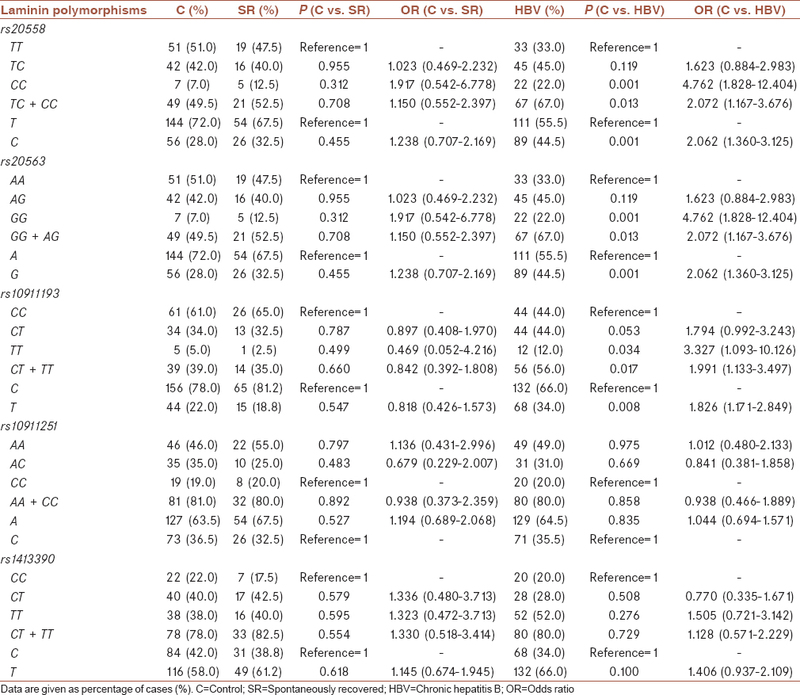 For rs10911251 and rs1413390 polymorphisms, no significant differences in allele or genotype frequencies between groups were found [Table 1]. 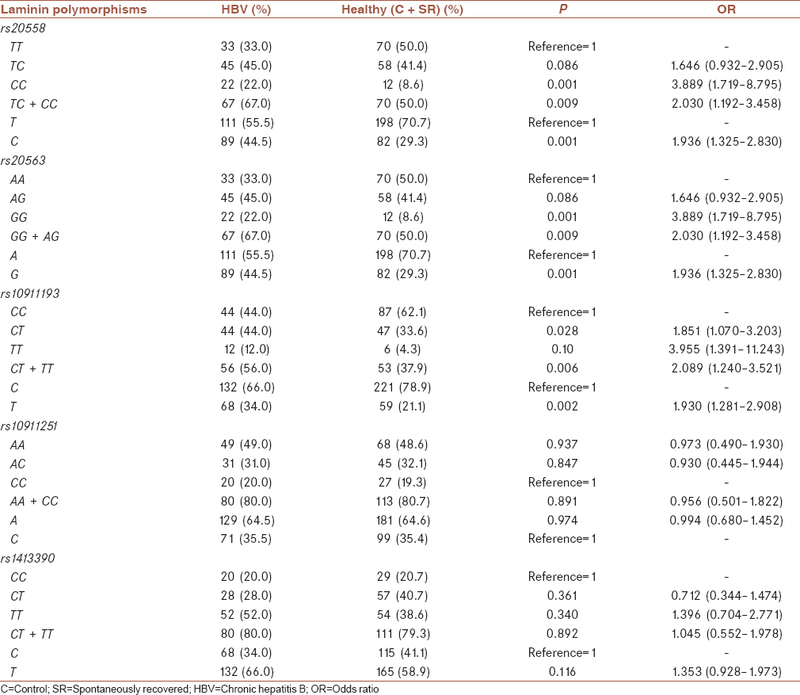 The results showing that there is not any relationship between the rs10911251A (P = 0.974) and rs1413390T (P = 0.116) and elimination of HBV [Table 2]. We calculated the rs20558, rs20563, rs10911193, rs10911251, rs1413390 haplotype association analysis, and found 5 genotypes. 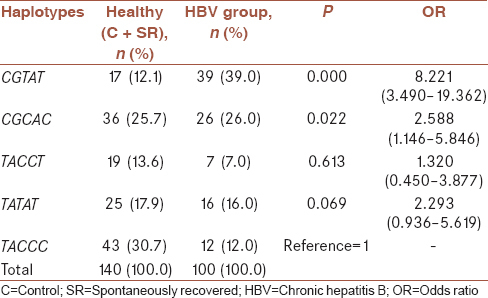 As shown in [Table 3] and [Table 4], the distribution frequency of haplotypes showed a significant association between chronic HBV infection compared to the C and SR groups. In our study, CGTAT haplotype had a higher frequency in HBV patients than C and SR groups. It means that this haplotype might relate to the natural history of the infection. Linkage disequilibrium (LD) analysis indicated that the rs20558 variant was in complete LD with the rs20563 variant (R2 = 1) [Table 3]. Serum levels of the laminin were significantly increased in the chronic HBV patients compared to the healthy groups (C + SR) (48.16 ± 14.19, 51.56 ± 11.53, 83.13 ± 15.43, in C, SR and HBV groups, respectively, P < 0.001). 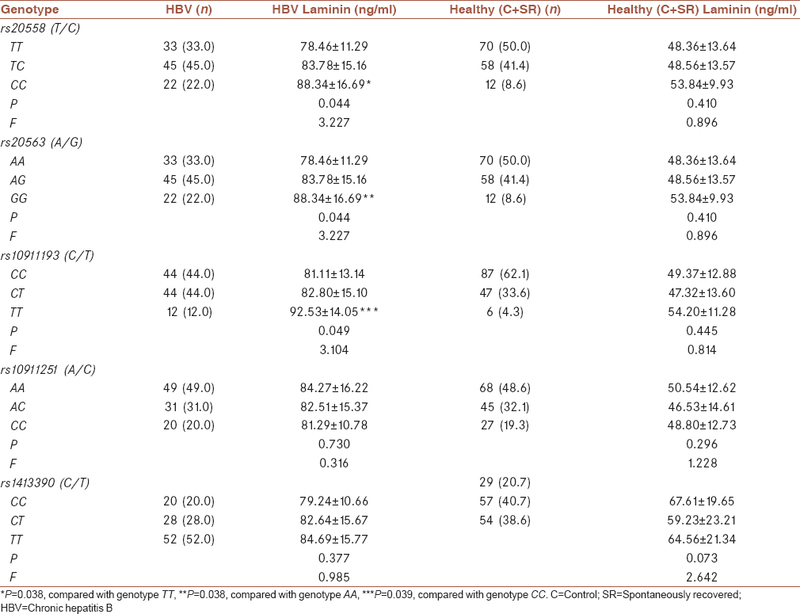 Statistical analysis indicated a significant association between laminin genotypes and serum levels of the laminin in HBV patients [Table 5]. Chronic HBV patients with rs20558CC, rs2056GG, and rs10911193TT genotypes had higher levels of laminin compared to rs20558TT (P = 0.038), rs2056AA (P = 0.038), and rs10911193CC (P = 0.039) genotypes, respectively. The results showed that subjects with at least one rs20558C, rs2056G, and rs10911193T alleles had increased levels of laminin, compared to the other alleles [Supplementary Table 3 [Additional file 3]]. In this case–control analysis of LAMC1 genetic variance, we provide important evidence that LAMC1 is a potential candidate gene for increased susceptibility to chronic HBV infection in Iranian populations. Although we did not find an association between the rs10911251, rs1413390 SNPs and chronic infection, we found a relationship between rs20558, rs20563, and rs10911193 SNPs and disease that strictly indicated a trend toward significance. The rs20558 and rs20563 were in the complete LD and confirmed the association between CGTAT haplotype and risk of chronic infection. In addition, we found that the serum level of laminin was significantly associated with susceptibility and risk of the chronic HBV infection. LAMC1 gene is of great interest due to the important role of laminin in ECM normal function. There are numerous supporting evidence that indicating the particular interest of LAMC1. LAMC1 gene may involve in chronic HBV infection, and further investigations can describe its possible involvement in disease pathology. LAMC1 gene encodes the γchain of laminin which is one of the ECM glycoproteins and produce the noncollagenous portion of the basement membranes. Nikolova et al. reported that the rs10911193 minor T allele was more prevalent among patients with early-onset prolapse. Chen et al. indicated that LAMC1 rs10911192, rs20563, and rs20558 SNPs did not associate with prolapse in Caucasians and African–Americans patients with prolapse, which might be due to their small sample size. The current study showed that rs20563 and rs20558 SNPs had a trend toward significance. The rs20563 G allele causes substitution of isoleucine to valine. This phenomenon is somehow conservative shift because both isoleucine and valine have hydrophobic side chains. The rs20558 C allele leads to insufficient conservative substitution from leucine to proline. These changes associated with tolerated and benign effects on the protein expression and function. The rs10911193 polymorphism is located upstream of the start site of the gene and may play a role in causing the chronic infection. This polymorphic region can affect the efficiency of the binding site for NFIL3. NFIL3 is transcriptional repressor and simultaneously expressed with LAMC1. This function of NFIL3 can increase expression of laminin gene which has polymorphism. The interaction between NFIL3 and LAMC1 also can affect the signaling pathway of IL three which is a regulatory cytokine in the host immune system. Since we also found the significantly different frequency of rs10911193 genotypes in chronic HBV patients and found an increased serum level of laminin in patients compared to the healthy controls, we hypothesized that it has a role in the existence of the chronic HBV infection. Therefore, it is recommended to analysis the association of LAMC1 polymorphisms with other outcomes of the HBV infection. The effective role of LAMC1 in encoding the laminin γ subunit attracted our attention. Collagen IV, laminin, nidogen, and perlecan are the main glycoproteins of the basement membranes. Laminin, as a noncollagenous member, is a heterogenous glycoprotein, which, can regulate various biological processes such as proliferation, differentiation, and migration of the cells. Laminin molecules contain α, β and γ chains which produce 15 distinct isoforms. Laminin γ1 subunit has a widespread distribution between laminin isoforms and basement membranes. Furthermore, laminin has important role in the interaction of ECM molecules. Therefore, changes in gene structure or expression can affect the host immune responses against pathogens. In addition, it has been reported that laminin may contribute to liver fibrosis during liver inflammations. Laminin has also been associated with normal tissue architecture and function through CT remodeling, and deficiency in gene function leads to progressive organ failure. Laminin deficiency related-inflammation can affect numerous organs in the human body and causes serious diseases such as liver chronic inflammation, cardiovascular diseases, pulmonary fibrosis and chronic kidney disease. According to the important role of laminin and specifically LAMC1, it seems that LAMC1 gene might have an effect in the predisposition of chronic HBV infection.In vivo studies indicated that deficiency of γ1 subunit could change the polymerization of the laminin molecule and also, other ECM proteins could not compensate the laminin production. Therefore, basement membranes were unable to cell migration, specifically, immune regulatory cells. Moreover, the studies have been reported that genetic variation in LAMC1 gene might alter the interaction between LAMC1 and nidogen during cell development, which is crucial for the development of hepatic cells in the liver. The role of LAMC1 in liver development emphasizes that the gene may have a role in physiology and maintenance of hepatic organs. It has been identified that a number of severe tissue integrity disorders caused by mutations in the coding sequence of laminin gene. Bonneau et al. implicated that LAMB1 gene deficiency was related to the cutis laxa. Helbling-Leclerc et al. indicated that LAMA2 gene variation was associated with the muscular dystrophy. The study of Pulkkinen et al. and Vidal et al. found that genetic variation in LAMB3 and LAMA3 genes were associated with Herlitzjunctional Epidermolysis bullosa. Based on the present study, the LAMC1 polymorphism in the promoter region is obvious mutation which can explain the risk of HBV infection and disease severity. It is likely that the polymorphism in LAMC1 gene is the risk factor for the existence of HBV infection and also is in LD with other mutations in laminin gene. Further studies with regard to the functional and population association between LAMC1 and chronic HBV infection can better explain the role of LAMC1 in the prediction of disease. In the current study frequency of the rs20558C, rs20563G, and rs10911193T alleles significantly increased in a sample of Iranian patients with HBV infection. This finding supports the predictive capacity of LAMC1. To the best of our knowledge, some SNPs studied have important effects on the susceptibility and outcomes of HBV infection. Furthermore, we found that laminin levels probably be dependent on the severity of the infection. Determination of the real effects of laminin polymorphisms needs more detailed studies. The restrictions of the current study, likely include sample size, different cultural backgrounds, epidemiological and geographical factors, study conditions and different gene-gene interactions. The results have shown the role of genetic polymorphisms of rs20558, rs20563, rs10911193, rs10911251, and rs1413390 of LAMC1 gene in the chronic HBV infection, and elucidated an association between chronic HBV infection and LAMC1 gene polymorphisms. Zhang X, Lu Y, Rong C, Yang D, Li S, Qin X, et al. Role of superoxide dismutase in hepatitis B virus-related hepatocellular carcinoma. J Res Med Sci 2016;21:94. Huang YH, Tao MH, Hu CP, Syu WJ, Wu JC. Identification of novel HLA-A*0201-restricted CD8+T-cell epitopes on hepatitis delta virus. J Gen Virol 2004;85:3089-98. Moudi B, Heidari Z, Mahmoudzadeh-Sagheb H, Hashemi M, Metanat M, Khosravi S, et al. Association between IL-10 gene promoter polymorphisms (-592 A/C, -819 T/C, -1082 A/G) and susceptibility to HBV infection in an Iranian population. Hepat Mon 2016;16:e32427. Moudi B, Heidari Z, Mahmoudzadeh-Sagheb H. Impact of host gene polymorphisms on susceptibility to chronic hepatitis B virus infection. Infect Genet Evol 2016;44:94-105. Heidari Z, Moudi B, Mahmoudzadeh-Sagheb H, Hashemi M. The correlation between interferon lambda 3 gene polymorphisms and susceptibility to hepatitis B virus infection. Hepat Mon 2016;16:e34266. Moudi B, Heidari Z, Mahmoudzadeh-Sagheb H, Hashemi M. Gene polymorphisms of macrophage migration inhibitory factor affect susceptibility to chronic hepatitis B virus infection in an Iranian cohort. Microbiol Immunol 2016;60:390-6. Keshvari M, Alavian SM, Behnava B, Pouryasin A, Sharafi H. The interferon lambda 4 rs368234815 predicts treatment response to pegylated-interferon alpha and ribavirin in hemophilic patients with chronic hepatitis C. J Res Med Sci 2016;21:72. Takakura M, Tokushige K, Matsushita N, Hashimoto E, Shiratori K. Possible involvement of cytokine gene polymorphisms in fulminant hepatitis. J Gastroenterol Hepatol 2007;22:1271-7. Gratchev A, Schledzewski K, Guillot P, Goerdt S. Alternatively activated antigen-presenting cells: Molecular repertoire, immune regulation, and healing. Skin Pharmacol Appl Skin Physiol 2001;14:272-9. Eskdale J, Gallagher G, Verweij CL, Keijsers V, Westendorp RG, Huizinga TW, et al. Interleukin 10 secretion in relation to human IL-10 locus haplotypes. Proc Natl Acad Sci U S A 1998;95:9465-70. Martin GR, Timpl R. Laminin and other basement membrane components. Annu Rev Cell Biol 1987;3:57-85. Budatha M, Roshanravan S, Zheng Q, Weislander C, Chapman SL, Davis EC, et al. Extracellular matrix proteases contribute to progression of pelvic organ prolapse in mice and humans. J Clin Invest 2011;121:2048-59. Goepel C, Hefler L, Methfessel HD, Koelbl H. Periurethral connective tissue status of postmenopausal women with genital prolapse with and without stress incontinence. Acta Obstet Gynecol Scand 2003;82:659-64. Falconer C, Blomgren B, Johansson O, Ulmsten U, Malmström A, Westergren-Thorsson G, et al. Different organization of collagen fibrils in stress-incontinent women of fertile age. Acta Obstet Gynecol Scand 1998;77:87-94. Coelho NM, McCulloch CA. Contribution of collagen adhesion receptors to tissue fibrosis. Cell Tissue Res 2016;365:521-38. Nikolova G, Lee H, Berkovitz S, Nelson S, Sinsheimer J, Vilain E, et al. Sequence variant in the laminin gamma1 (LAMC1) gene associated with familial pelvic organ prolapse. Hum Genet 2007;120:847-56. Chen C, Hill LD, Schubert CM, Strauss JF 3rd, Matthews CA. Is laminin gamma-1 a candidate gene for advanced pelvic organ prolapse? Am J Obstet Gynecol 2010;202:505.e1-5. Ensembl. Variation rs20563, Genomic Context, Gene/Transcript. Available from: http://www.useastensemblorg/Homo_sapiens/Variation/Mappings?dbcore; r1:183085255-183086255;v.rs20563;vdbvariation; vf22315596. [Last accessed on 2012 Jan 12]. Cowell IG, Hurst HC. Transcriptional repression by the human bZIP factor E4BP4: Definition of a minimal repression domain. Nucleic Acids Res 1994;22:59-65. Cowell IG. E4BP4/NFIL3, a PAR-related bZIP factor with many roles. Bioessays 2002;24:1023-9. Murray P, Edgar D. Regulation of programmed cell death by basement membranes in embryonic development. J Cell Biol 2000;150:1215-21. Smyth N, Vatansever HS, Murray P, Meyer M, Frie C, Paulsson M, et al. Absence of basement membranes after targeting the LAMC1 gene results in embryonic lethality due to failure of endoderm differentiation. J Cell Biol 1999;144:151-60. Spofford CM, Chilian WM. Mechanotransduction via the elastin-laminin receptor (ELR) in resistance arteries. J Biomech 2003;36:645-52. Friedman SL, Sheppard D, Duffield JS, Violette S. Therapy for fibrotic diseases: Nearing the starting line. Sci Transl Med 2013;5:167sr1. Smyth N, Vatansever HS, Meyer M, Frie C, Paulsson M, Edgar D, et al. The targeted deletion of the LAMC1 gene. Ann N Y Acad Sci 1998;857:283-6. Bonneau D, Huret JL, Godeau G, Couet D, Putterman M, Tanzer J, et al. Recurrent ctb(7)(q31.3) and possible laminin involvement in a neonatal cutis laxa with a marfan phenotype. Hum Genet 1991;87:317-9. Helbling-Leclerc A, Zhang X, Topaloglu H, Cruaud C, Tesson F, Weissenbach J, et al. Mutations in the laminin alpha 2-chain gene (LAMA2) cause merosin-deficient congenital muscular dystrophy. Nat Genet 1995;11:216-8. Pulkkinen L, Christiano AM, Gerecke D, Wagman DW, Burgeson RE, Pittelkow MR, et al. Ahomozygous nonsense mutation in the beta 3 chain gene of laminin 5 (LAMB3) in herlitz junctional epidermolysis bullosa. Genomics 1994;24:357-60. Vidal F, Baudoin C, Miquel C, Galliano MF, Christiano AM, Uitto J, et al. Cloning of the laminin alpha 3 chain gene (LAMA3) and identification of a homozygous deletion in a patient with herlitz junctional epidermolysis bullosa. Genomics 1995;30:273-80.